Elaine Macmillan is the new bookings manager for Garvald village hall. You can contact her via the Garvald Village Hall Bookings form. This entry was posted in Announcements, Garvald Village Hall, Hall Hires on October 24, 2018 by Admin. Here is a brief update from the Village Hall Committee on some recent improvements we’ve made to the hall, along with information about some of the upcoming events. Redecorated the main hall, entrance space, corridor and kitchen. We think it looks great and hope you will agree! We will be posting some images soon! This was paid for mainly from hall funds but we also received a grant of £1,000 from the East Lothian Council Civic Pride Fund for which we are very grateful. Replaced all the lighting in the main hall with new LED lighting which looks great and really sets off the newly decorated hall – while also helping reduce our energy costs. We also improved some of the security lighting on the approach to the hall. Many thanks to Garvald and Morham Community Council who gave us a grant to cover the cost of this – much appreciated once again! Installed a dishwasher in the kitchen which we hope will prove very useful for large village events as well as weddings, parties, etc. Installed a user-friendly timer for our heating system that can be controlled remotely. Installed a key safe to help improve access for residents – we are looking at other ways of making it easier for local people to use the hall on a less formal basis and will provide a future update. In addition, last year we installed a new sound system and replaced (or improved) many of the windows in the hall. We think the hall is now a much improved asset for the Garvald Community and we are keen to see it used as much as possible. To this end we are also looking to simplify our charging structure and booking processes to make it easier and less expensive for residents to use the hall. We have already agreed that Village events that are open for all villagers can make use of the hall for free – e.g. the Children’s Christmas party, Village Christmas dinner, Hogmanay Ceilidh, etc. Further updates on our revised pricing structure and booking process will be posted soon – watch this space. In order to help us maintain and improve the hall for community use our main source of income comes from hire charges, particularly wedding bookings. We currently try to limit the number of weddings to around 6 per year to avoid inconvenience to the village and minimise time demands on the committee. We also try and achieve a good spread of the weddings over the main wedding season – usually April to October. However this year – despite our best efforts – we have 3 weddings in May on consecutive weekends. We hope villagers will not be too inconvenienced and will try to ensure a better spread next year. The upside is that the rest of the summer will be less busy than usual. We hope you find this update useful. If you have any comments or questions do contact us. Chairperson – Jim Pattison – 830662, or email via the Village Hall General Enquiries form. Viki Freeland is the current bookings manager. You can contact her via the Garvald Village Hall Bookings form. This entry was posted in Garvald Village Hall, Hall Hires on April 15, 2018 by Admin. Looking for a wedding venue? Something a “bit different?” A “blank canvas” onto which you can project your wishes and whims, be it a hoe-down something more Jazz Age or just a plain old country idyll? 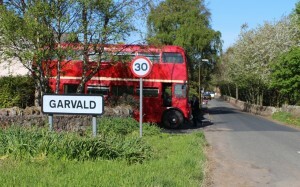 Well look no further, as Garvald Village Hall really does tick all the boxes. The Hall has “something new” though, many things actually. It has been extensively but considerately modernised over the years, and made totally accessible to wheelchairs. The kitchen is of particular note, with large work services and a commercial hob. It has enabled both professional and amateur caterers to turn out everything from finger buffets to fine dining. Guests don’t go hungry in Garvald! “Something blue?” The sky of course, as the weather can be glorious in East Lothian. And if you don’t believe, just look at the pictures on the rest of this website. There’s proof! 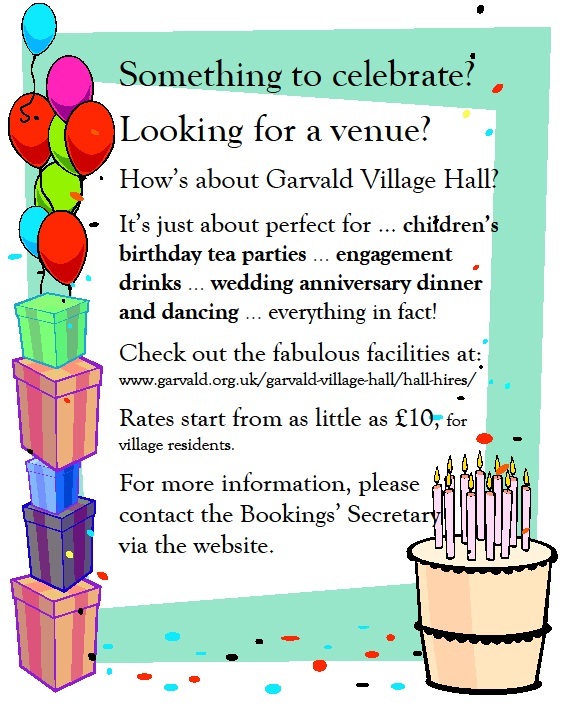 Should any of this have piqued your interest, and got you thinking that Garvald Village Hall might just be the wedding venue for you, then please do not hesitate to get in touch. Click here to contact the volunteer in charge of bookings. They will be able to answer any questions, and give you even more ideas. Cheers! This entry was posted in Garvald Village Hall Trust, Hall Hires on September 1, 2014 by KM. What a beautiful sunny day for a wedding. Congratulations to the happy couple! This entry was posted in Hall Hires on May 25, 2013 by Admin. Come and play table tennis at Garvald Village Hall! Garvald residents: U16s 50p per person, Over 16s £1 per person. Non-residents: Normal hall hire rates apply. Pick up the hall key and table tennis rules/guidelines from the village hall key holders (as listed on the Village Hall noticeboard). This entry was posted in Clubs and Classes, Hall Hires and tagged Table Tennis on February 23, 2012 by Admin.